Medford City Hall is located at 411 West 8th Street, Medford, OR 97501; phone: 541-774-2000. 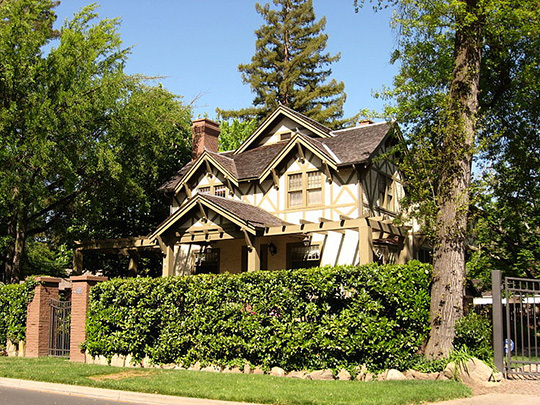 Photo: Dr. John F. and Mary Reddy House, ca. 1911, 122 Oregon Terrace, Medford, OR. Listed on the National Register of Historic Places in 1987. Photographed by User:ZabMilenko (own work), 2009, [cc-by-3.0 (creativecommons.org/licenses/by/3.0)], via Wikimedia Commons, accessed April, 2013. Medford is located in Jackson County, Oregon, of which it is the county seat. Originally settled in the late 1840s and early 1850s, the original impetus for development in the region was the early 1852 discovery of gold in what is today the City of Jacksonville. Population and development boomed, with Jackson County being among the largest and most influential regions during Oregon's territorial period. Jacksonville, founded around the mines, was named county seat and remained the focus of the area's economy and transportation network throughout the settlement period. In the early 1880s as the railroad pushed south from Roseburg, offering Jackson County its first direct rail link, Jacksonville's isolated and rugged terrain was considered disadvantageous and the Oregon and California Railroad (O & C RR) elected to bypass the city. The main line was instead surveyed through open land in the essentially flat center of the Bear Creek Valley. A group of investors, C.W. Broback, I. J. Phipps, Conrad Mingus, and C. C. Beekman, together deeded portions of property along the west bank of Bear Creek to the O&C RR in late October 1883. "The railroad agreed in return to build a depot and establish a townsite." As an incentive, the Oregon and Transcontinental Land Company, a railroad subsidiary, was given alternate blocks throughout the new town, which was formally laid out in December 1883 by surveyor J. S. Howard. The source for the name of the city is generally given as being in honor of the hometown of railroad construction chief David Loring, a native of Medford, Massachusetts — a clear indication of the prominent role the line played in Medford's initial development. Medford was incorporated as a city in February 1885 and continued to grow, boasting a population of just under 1000 people by the end of the decade. Commercial development grew too and "... an increasing number of business firms gradually filled the empty spaces along Front Street, Seventh Street (now Main) and Central Avenue." In 1890 a second rail connection was established, with the opening of the Rogue River Valley Railroad, a short line that connected the county seat at Jacksonville with Medford for both passenger and freight traffic. The growing agricultural export of fruits and grains provided Medford with a constant stream of visitors, providing a strong base for the growing retail and service center around the depot. George Kramer, M.S., Historic Preservation Consultant, Medford Downtown Historic District, Jackson County, Oregon, nomination document, 1997, National Park Service, National Register of Historic Places, Washington, D.C.